Bringing dental laboratories and health professionals the most innovative and highest of quality teeth for denture wearers today! All Denture Labs International proudly presents Turbo Dentures™ which create a natural feeling of chewing with the least amount of effort! We are committed to helping as many people as possible worldwide! For decades All Denture Labs Int’l has been an innovator when it comes to research and development of higher quality and exceptional performance teeth for denture wearers. 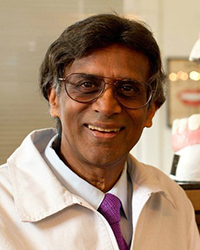 Sundru Moodley, MSC,LD, CDT president and founder of All Denture Labs International brings 40 years experience along with having hand-crafted over 15,000 sets of dentures! He has been able to patent exceptional innovative denture teeth through the years. The first was a bladed edge posterior which out performed traditional dentures. Mr. Moodley and the other principals of All Denture Labs International now have a patent pending on Turbo Dentures. All Denture Labs International is passionate to make Turbo Dentures available to denture labs and dental professionals worldwide. I am a very happy patient, the most important thing is the chewing feature. I chew food like I’ve never done before. I grind up food now! I have worked with All Denture Labs for years and have had great success with the Turbo Dentures! I feel very natural about my dentures right now. I can chew any food without being ashamed in a restaurant or anywhere! Kindly fill in your information and we will be in touch as soon as possible!